Add this one to your holiday baking list! 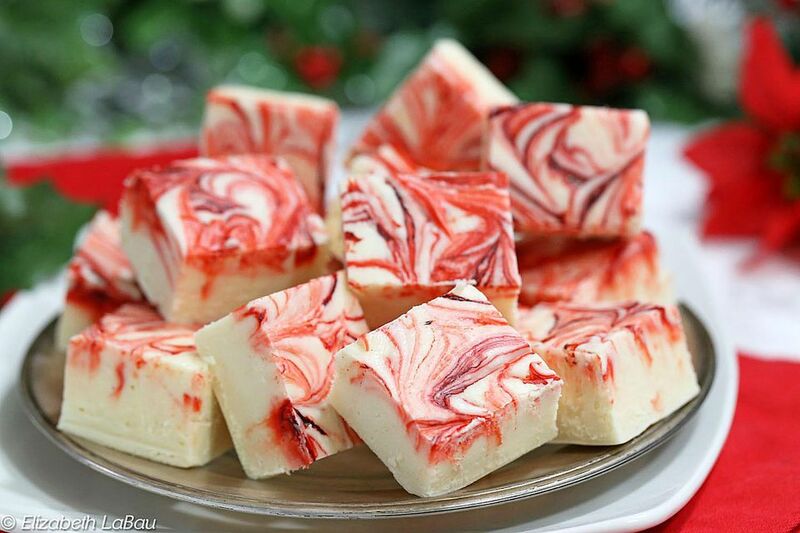 Peppermint Swirl Fudge is a quick and easy white chocolate fudge with bold peppermint flavor. It's a delicious Christmas fudge that can be made ahead and stored for up to two weeks. It also make a great holiday gift, so make a double batch and give some to all of your friends and family! 2. In a medium saucepan over medium-high heat, combine the milk, sugar, butter, and salt, and stir until the sugar melts. 3. Bring the mixture to a boil and boil, stirring constantly, for 5 minutes. 4. After 5 minutes, remove the pan from the heat and stir in the marshmallow cream, white chocolate chips, and mint extract. Stir quickly and vigorously to incorporate all of the marshmallows and chocolate. 5. As soon as the candy is smooth, scrape it into the prepared pan and smooth it into an even layer. Dot the top of the fudge with drops of red food coloring, and swirl a toothpick through the top to create beautiful red swirls on the white fudge. 6. Let the fudge cool at room temperature or in the refrigerator until firm. To serve, cut into 1-inch squares. Click Here to View All Christmas Candy Recipes! Click Here to View All Candy Cane Recipes!